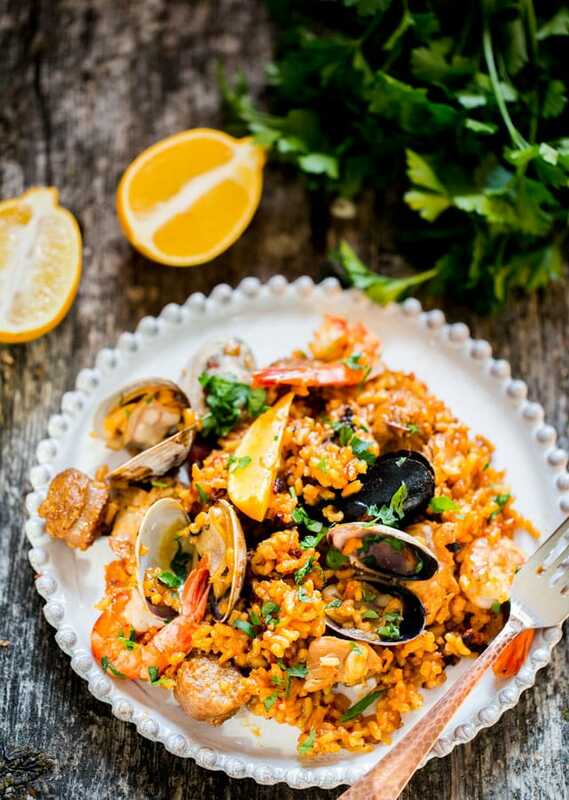 This Chicken and Seafood Paella is a classic Spanish rice dish made with Arborio rice, packed with chicken, sausage, mussels, clams, shrimp and loaded with flavor. I have a romantic dish for you today. At least I think it’s romantic because this isn’t something you’d make every day. Not because it’s hard, trust me it’s quite easy to make this paella, but because it’s a bit more expensive. Not to mention how gorgeous this dish is. 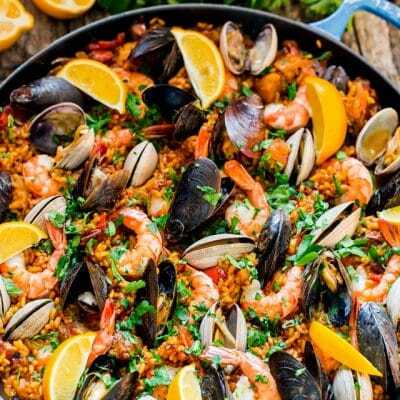 This chicken and seafood paella will sure surprise and impress your significant other or guests. I can tell you my husband loved this and ate 3 servings in one sitting. That’s about the best compliment I could get. 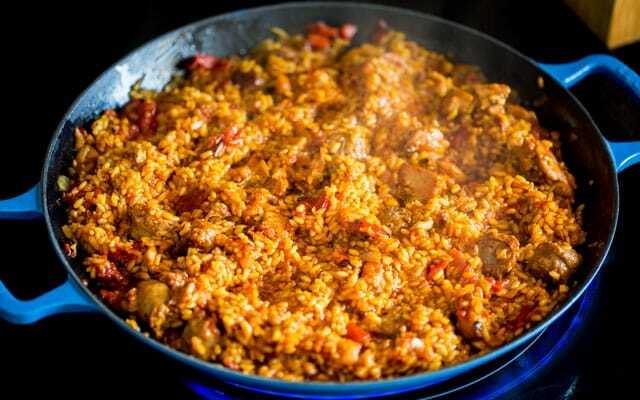 Paella is a classic Spanish rice dish and it’s widely regarded as Spain’s national dish. Personally, I love it, especially because it’s so versatile. I make paella quite often and make it with different proteins. 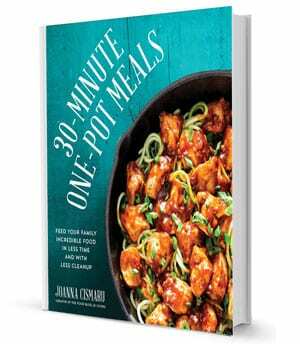 In my new cookbook there is a quick 30 minute paella recipe in my cookbook coming up. I do want to mention that this recipe is by no means authentic, this is just my version of paella. 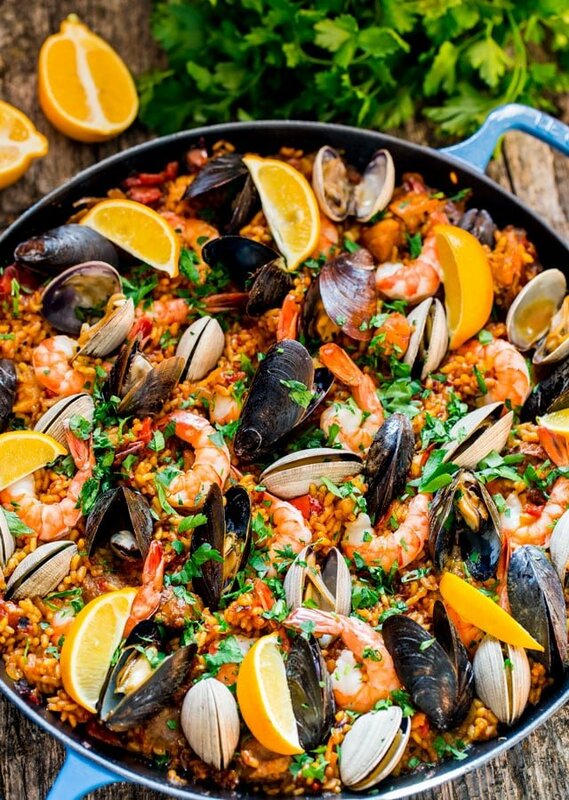 I strongly recommend using a Paella pan because it has a wider surface and the secret of paella is cooking everything evenly in a single layer and as it cooks the rice gets toasty and crispy at the bottom and that’s what you want in a good paella. 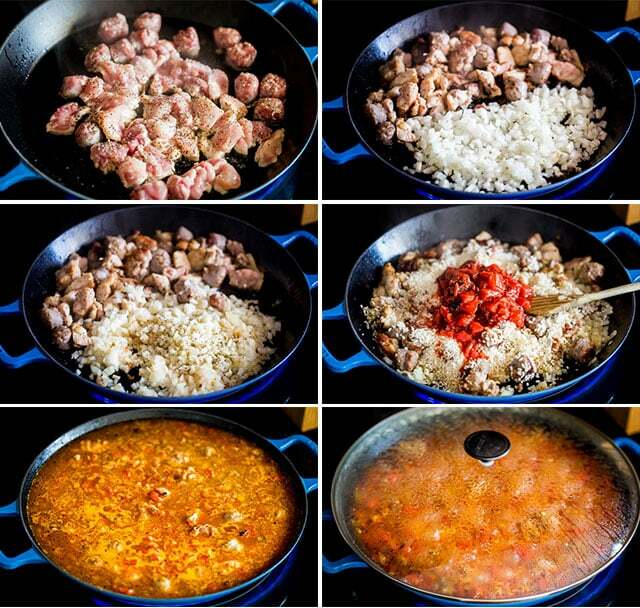 Paella is usually made with chorizo sausage, that’s why I listed chorizo sausage in the ingredients list, but I didn’t have any, so I just used some Italian sausage I had, but I would recommend chorizo if you have it. I started with some chicken thighs I chopped up, but you could use chicken breast as well. You’ll first want to cook the chicken and sausage in a little bit of olive oil until it starts to brown and is no longer pink. Move the chicken and sausage to one side of the pan and then add the chopped onion and cook for a couple more minutes until the onion becomes soft and translucent. You can then add the garlic, the rice and here I go again with some fire roasted tomatoes. I can’t help it, I really do love those fire roasted tomatoes. Regular diced tomatoes work just as well. Stir everything together then you can add the broth, I used a vegetable broth which is why you see that rich dark color, but chicken broth works as well. Now is the time to add the smoked paprika, hot sauce and saffron. Saffron is quite an expensive spice, but you really want a bit of saffron here, a little goes a long way. You can now cover the paella pan with a large lid, the only large lid I found that fits the paella pan is from my wok, but it worked great. Cook the rice for about 15 minutes or until the rice has absorbed most of the liquid, but you’ll notice that the rice is still not cooked through. 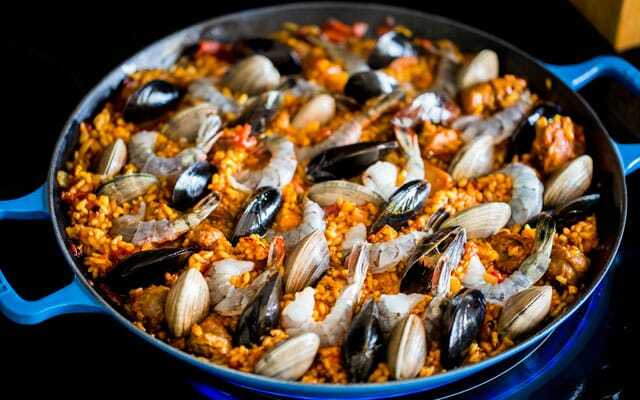 Shrimp, clams and mussels are the common seafood ingredients used in paella. My favorite part is arranging all the seafood. I used large tiger shrimp, deveined and shelled but I left the tail on for a nicer presentation. Just arrange the clams, mussels and shrimp around the pan. Cover the pan again and cook for another 10 minutes or until the mussels and clams open up. Let me just tell you your house will smell incredible, your neighbours might come and visit you. Last step is to garnish this gorgeous dish with some fresh parsley and lemon wedges and you’ve got yourself dinner. You’ll notice that crispy layer of rice at the bottom of the pan, have to say that’s my favorite part, it’s loaded with flavor. I made this recipe and by it’s my favorite paella recipe. It’s easy to make and the flavors are wonderful. I think the fire roasted tomatoes put it over the top. I didn’t have the smoked paprika but substituted it with a tumeric and smidgen of liquid smoke. This will definitely be my go-to paella recipe. Thanks for sharing. If you love this recipe, try these! 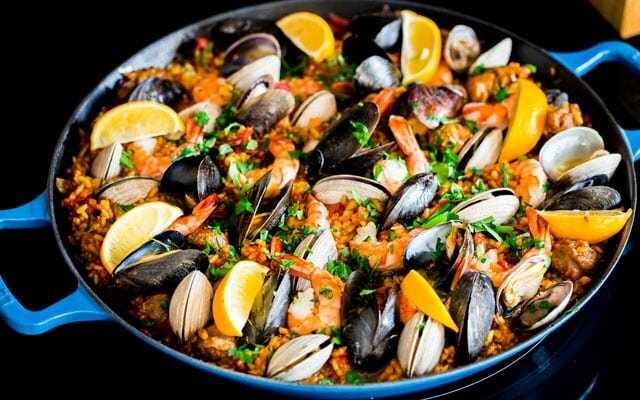 Chicken and Seafood Paella - a classic Spanish rice dish made with Arborio rice, packed with chicken, sausage, mussels, clams and shrimp and loaded with flavor. In a large paella pan heat the olive oil over medium heat. Add the chicken and sausage, season with salt and pepper, then cook for about 5 minutes until the chicken is no longer pink. Move the chicken and sausage to one side of the pan, then add the onion to the other half, season with a bit of salt and pepper and cook for 2 minutes until the onion becomes translucent and soft. Add the garlic and cook for another minute. Add the arborio and fire roasted tomatoes to the pan and stir well. Let the rice cook in the sauce from the tomatoes for about 5 minutes, you will notice it will start to brown on the bottom, which is what you're looking for. Add the broth, hot sauce, smoked paprika, saffron and season with salt and pepper if needed. Stir everything together and cover with a large lid. Cook for about 15 minutes or until most of the liquid has been absorbed by the rice. The rice will not be cooked through at this time. Turn down the heat and stir the rice around a bit, you will notice the crust on the bottom of the pan, that's what you're looking for. Arrange the shrimp, mussels and clams over the rice, cover with a lid again and cook for another 10 minutes or until the mussels and clams open up. 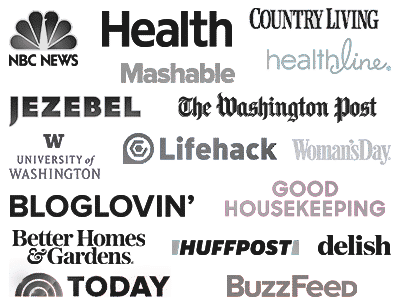 *Arborio rice is an Italian short-grain rice. I used vegetable broth here, that's why the color of the broth is so rich and dark, if you use chicken broth it will be a lot lighter in color. If you don't have a paella pan, a large skillet will work just as well. Any type of sausage will work for this recipe. You can use chicken breast instead of thighs. Marvelous! My husband and I love love loved it! Our youngest son has Celiac. We made sure all ingredients were gluten free which was a breeze. We all just loved it. Will happily make again and for company! A friend made this and invited us over. It was delicious. I now have the recipe and will give it a try myself. I love recipes that have eye appeal as well as wonderful flavor and this one fits the bill. I just made your paella and it was very good. I didn’t find fire roasted tomatoes and added canned tomatoes and roasted red peppers. Since it was my first time it took a longer time than an hr to do everything. can fire roasted diced tomatoes be substituted or can i make them at home? I am in Great Britain and struggle to get these on time for party. You can definitely use regular diced tomatoes, I just love the extra smokey flavor the fire roasted tomatoes give. If you know how to make them at home, by all means. You wouldn’t need any spices, Marietta. Fire roasted tomatoes are just that, tomatoes roasted on grill, so you could just do that or I’d put them on a baking pan, drizzle some olive oil over them and roast them in the oven at a high temperature, maybe 400 F degrees for about 45 minutes. Do keep an eye on them, as I’m not positive on the time, but you want to make sure they get nice and roasted, almost char like on the skin. Once they’re done, just chop them up after they cool and add them to the paella.